2308: That's me done for tonight. I'll be back on Sunday, early, for five Premier League games and another (hopefully better) FA Cup semi-final. Promise me, if you get the chance, you'll check out Xavi's two passes for the Barca goals today? Nice one. Sleep tight. From Anon, via text to 81111: "Important to point out the size of this victory in another context. This was Real's first dropped points at home ALL season!" From wonderboi711 Twitter: "New word for sublime - Xavi." 2300: For Barca's three-point lead in La Liga, see effectively four points - don't forget, in Spain teams that finish level are separated by their head-to-head record, so if Barca and Real finish on the same points total now, the Catalans will win the title. From redandblackT on 606: "Why are the Madrid players going off the pitch? They should just get a guard of honour for Barcelona and pay homage to this great team." 2254: There are about 400 Barcelona fans inside the Santiago Bernabeu stadium in Madrid and they are having the time of their lives. Barca have a ridiculous 80 points from their 31 league games this season. A stunningly simplistic victory in the end for Barcelona, who are surely now well on their way to a 20th Spanish league title? Lionel Messi will take the headlines, but Xavi was simply sublime. 2250: Karim Benzema flashes a header wide from a Sergio Ramos cross. How pleased will the rapidly improving Victor Valdes be if he keeps a clean sheet? 2250: Iker Casillas looks devastated. This defeat will hurt every bit as much as the 6-2 mauling Real Madrid were given in their own back yard by Barca last season. Their chance of winning the league is slipping away. 2248: Injury time begins, and we are due four minutes of it to prolong the agony for Real Madrid and their fans who have bothered staying. 2245: Can't remember one of these games descending into nothing more than a training game before, but that's pretty much what the second half has become. 2243: Raul gets the ball in the Barca net, but it's disallowed by the referee for handball - probably against Karim Benzema. 2241: Cristiano Ronaldo must be injured, because he's a shadow of the man who has been in devastating form in recent weeks. He is easily barged off the ball by Daniel Alves and it's all too simple for the visitors. Garay is booked now as the Madridistas begin to leave the Santiago Bernabeu. 2239: About eight minutes left of normal time and this one's all-but over already - Real 0-2 Barca. From Il Principino on 606: "Xavi has been the best player on that pitch tonight by a country mile." 2236: Barca take Gabriel Milito off and send on Rafa Marquez, while Real bring Karim Benzema on for Gonzalo Higuain. 2235: Another amazing save from Iker Casillas to deny Lionel Messi, who chests the ball down from a (yawn) brilliant Xavi pass and fires in a volley - but Casillas sticks his left foot out to make a fabulous stop. 2232: If anyone can get Real back into the game it's Raul - this is his 30th appearance in El Clasico and he has scored 10 goals in this fixture in the past (only Alfredo di Stefano, 14, and Cesar Rodriguez, 12, have more). 2230: I know Real have been a bit disappointing tonight, but this Barcelona team remain a joy to watch. I know some of you think I hype them up too much, but it's so enchanting I just don't care anymore. 2229: Magnificent save from Iker Casillas to deny Lionel Messi after another wonderful, wonderful slide-rule pass from Xavi. Messi's shot is arrowing into the far corner but Casillas gets a strong arm on it. From Ali, London, via text to 81111: "Granted, Casillas is brilliant, but is just me or is Valdes playing better every time I watch Barca? And then there's Reina... Do you reckon they would mind sharing?!" 2226: Cristiano Ronaldo has a shot saved by the legs of Victor Valdes. Real bring on the great Raul for Rafael van der Vaart. 2225: Sergio Ramos has a wild swing at Lionel Messi as Messi tries to let the ball run out for a Barca corner. Ramos is a bit lucky not to be booked for that. From Simply10United on 606: "When Man United played Barca in the Champions League semi-final two years ago, Xavi said after the second leg that he thought he was the best player over the two legs. At the time I thought he was being cheeky, but the lad is pure class." 2222: Another Cristiano Ronaldo free-kick, this time from 30 yards, bounces just in front of Victor Valdes and into the arms of the Barcelona goalkeeper. About 25 minutes left, still Real 0-2 Barca. 2220: Barcelona take Maxwell off and bring on Andres Iniesta. 2219: ... Cristiano Ronaldo's free-kick hammers into the Barcelona wall. Still not sure what he was booked for. 2216: What a chance for Rafael van der Vaart. He escapes a linesman's flag - Gabriel Milito is playing him on - but shoots early, left-footed from 20 yards and Victor Valdes makes a good save low down to his left. 2215: Fernando Gago forces Victor Valdes to save, before Gonzalo Higuain slams wide with his right foot from outside the area. Real have brought Guti on for what he called on Friday his last Clasico performance. Barca goal: Title over? If it was quiet before... Xavi, just inside the Real half, plays another inch-perfect pass - it's the weight that is brilliant on this one - into the path of Pedro and suddently he's the wrong side of Raul Albiol. Pedro keeps his cool and slots coolly left-footed past Iker Casillas. 2213: Cristiano Ronaldo shoots from the edge of the Barca box, but it's a fairly tame left-foot effort by his standards and Victor Valdes saves easily. 2211: Real break and just as it looks as though Cristiano Ronaldo is going to slip in Gonzalo Higuain inside the Barca area, Gerard Pique slides in a fine interception. Great defending. 2209: They nearly came to life there, as Marcelo's 20-yard left-foot drive forced Victor Valdes to pluck the ball away from the top corner. Barcelona's Maxwell is booked now for a foul on Sergio Ramos. Cristiano Ronaldo is limping a touch, it seems. 2207: Barca are knocking the ball around with consummate ease - the pressure Real were exerting in the early stages is a thing of the past at the moment. I just cannot believe how quiet 80,000 people can be. From Gordon_Fer on Twitter: "I think I'll catch the highlights on MotD 2 tomorrow, you can't leave this game." 2205: Nope - the fans are quiet again. Massive contrast to the start of the first half and the deafening whistling. It's like the Madridistas are resigned to their fate already. Nonsense - there's a game to be won here. 2203: The 80,000 Real Madrid fans are going to have to pick their boys up as we get under way in the second half. It's Real 0-1 Barca. 2201: Match of the Day is on BBC One and online at 2215 BST - but if you must watch it, don't forget to keep popping back here, will you? From Mo from London, via text to 81111: "Stevo, I like you am an unashamed Messi admirer. But I want to ask you, if he does a Ronaldinho and goes missing for a few seasons, would you still rate him as the greatest ever?" From Blaffert on 606: "Great match... the quality is absolutely stunning. I agree not many chances, but that's because the level is so high." 2153: Barcelona have kept 16 clean sheets this season, more than any other club in La Liga, so Real face a tough task to turn this around. Lionel Messi has become only the third Barca player ever to score 40 goals in a season, after Ronaldo (47) in 1996/97 and Mariano Martin (44) in 1942/43. From codebyfire on Twitter: "Messi's genius is so often fuelled by the other magician Xavi (what a pass) - that's why Argentina won't win the WC." Perhaps not the greatest 45 minutes between these teams ever, but Barca have done exactly what they need to so far. Have Real Madrid got an answer to Lionel Messi's first-half hammer blow? 2146: Into injury time at the Bernabeu and we'll have a minute of it. 2144: Real break with pace and Marcelo keeps up with Gonzalo Higuain, but Higuain's crossfield pass to Cristiano Ronaldo is behind the Portuguese and he falls over in disgust. Not quite at it so far, the Real forward line tonight. From Anon, via text to +44 7786200666: "Here I am, an Indian in New Delhi awake at two in the morning hooked to a Brit site for El Clasico! Football is the language of the universe! And I am sure Messi is from another planet - that goal proves it!" 2141: Half-chance to Real's Gonzalo Higuain after a ball over the top beats Gerard Pique, but the Argentine striker volleys left-footed miles over the bar from a difficult angle. 2139: How did he miss? A Real corner is headed to the back post to Xabi Alonso and he heads over from point-blank range. Moments later Dani Alves is booked for a foul on Marcelo. 2137: No Barcelona coach has ever won four Clasicos in a row. Pep Guardiola is the Barca manager for only his fourth Clasico tonight. 2135: That goal summed up the dual genius of Lionel Messi - yes, the finish was stunning, but it was the fact that he got straight up after the clash with Sergio Ramos and got on with the game that was equally crucial. Terrific stuff, so what can Cristiano Ronaldo reply with? Barca goal: Iker Casillas punches his crossbar in fury - turns out there is no way of stopping Lionel Messi. Moments after going down having seemingly clashed with Sergio Ramos, he races forward and takes a stunning Xavi pass on his chest, past Raul Albiol and then slips it under the advancing Casillas. It's his 40th of the season and the Bernabeu has gone silent. 2131: Xavi does shoot this time, but his free-kick from 30 yards is tame and hits the Real wall - possibly the hand of Xabi Alonso. Seconds later, Xavi is booked for his furious protests to the referee. It's tetchy. From Wengers Optician on 606: "Xavi seems reluctant to shoot. He should have cut in and had an effort at least." 2127: Barca attack, but instead of having Bojan Krkic or Thierry Henry to look for, they've got Dani Alves running offside as Xavi tries to decide who to pass to. They've had so much of the ball - is Pep Guardiola's starting XI too defensive? 2125: Did I call Xabi Alonso the Liverpool man? Uh-oh. Meant former, obviously. Sorry Reds fans, didn't mean to rub it in. 2123: Marcelo surges into the Barca half, with step-overs-a-plenty as he goes, but the move ends with Xabi Alonso lashing wide from 25 yards. 2122: It's a slightly slower tempo than you might have expected and Barcelona are on top right now, at least in the ball-retention stakes. Chances at a premium, though. 2120: Lionel Messi is shown a yellow card for a blatant handball by the right touchline. Apart from that one run into the box, he's had a quiet start, the Argentine. From hkthetruth8 on Twitter: "What does Henry have to do to get a game? Ibra injured, Alves up front! Rumour to join MLS seems more likely as season goes on." 2118: Now it's Cristiano Ronaldo's turn to race towards the Barca box and as he gets inside, he goes down under a challenge from Gerard Pique. Nothing doing there either. 2116: ... Dani Alves does indeed take it, and slams it miles over the Real crossbar. 2114: Xabio Alonso is officially the first man in the book. The former Liverpool man has been flying into early tackles and he pays for that late one on Pedro. 2112: Lionel Messi skips into the Real penalty area and as he tries to pull the ball back, he goes down under a challenge from Raul Albiol. There's contact, but nothing given - and Messi gets straight up and gets on with it. 2111: Sighter for Cristiano Ronaldo as he nutmegs Sergio Busquets and then takes on Gerard Pique, but the defender has enough pace and snuffs out the danger. By the way, the yellow card shown to Pique at 2108 has been rescinded because of the offside. From Chip it like Vela on 606: "I'm already beginning to like this ref... hasn't fallen for any of the theatrics on display so far and hasn't blown a foul for every tackle." 2108: Gerard Pique is booked for a blatant handball on the edge of the Barca box as Gonzalo Higuain tries to slip in Cristiano Ronaldo. Ronaldo was offside anyway, but not a great start for the usually accomplished Pique. 2107: Gerard Pique has been forced to play a couple of long balls already tonight, which tells you how much pressure the Real forwards are putting on the Barca backline. The second long ball is booted out of play and the home fans promptly jeer Pique. 2105: Looks strange, Dani Alves playing ahead of a right-back. Panic measure or inspired move from Pep Guardiola? He's allowed a few mistakes, in fairness to the Barca coach. Meanwhile Cristiano Ronaldo goes down, but nothing doing. 2103: Xabi Alonso goes in for a crunching challenge with Pedro and the Barca forward is left hobbling around a little bit. No holds barred in this one. 2102: Every Barca touch is booed incessantly by the locals - do they know how much possession Pep Guardiola's side usually has? 2101: After a minute's silence for the tragic death of the Polish leader Lech Kaczynski, we are under way in the capital of Spain. Get ready to rock and roll. From AdZY16 on Twitter: "Remember when you could mention Ronaldo and Messi in the same breath? Ronaldo must have a point to prove - still, 2-0 to Barca." 2057: The teams are out and we are moments away from kick-off. I can't be bothered to play this down any more - it's the football match I've most looked forward to for absolutely ages. It's Real Madrid v Barcelona. 2056: They're playing Nessun Dorma inside the Bernabeu. This game's got no relevance to Italia 90 whatsoever, but well done Real for choosing the best footy-related tune of all time. From Tom in Manchester, via text to 81111: "Looking at the table it all looks a bit Scottish doesn't it Stevo?" 2052: Ever wondered just how Barcelona have been so good in the last few years? 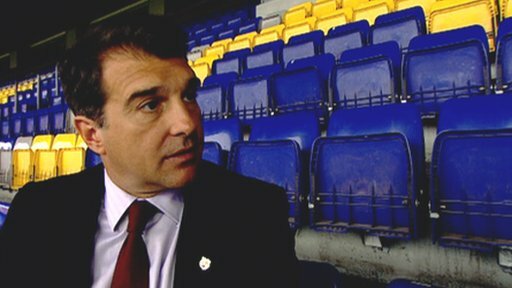 If you are able to, check out Football Focus going behind the scenes at Barca, including a chat with president Joan Laporta and the club's new honorary president, the great Johan Cruyff. From Torresque on 606: "Looks like Pellegrini's done his homework and put Arbeloa at left-back, so he can keep Messi in his pocket like he did when Barca played Liverpool a couple of years ago. Unfortunately in that time Messi has decided to transcend the human race." 2045: Get in touch if you've got some Clasico chat, though go easy on the Spanish, I'm not quite up to speed (yet): text us to 81111 (UK) and +44 7786200666 (worldwide); hit me a tweet @Stevo_football; and join the 606 thread that has been going on all day. 2042: Definitely worth pointing out that in Spain, it's the head-to-head record that counts at the end of the season, not goal difference. So Barca beat Real 1-0 in the first game in November, so Real have to win 2-0 tonight to have a better head-to-head record. If it's a draw in the Bernabeu, Barca will be in pole position to take the title. 2039: So, Xavi Alonso is fit for Real Madrid and starts in the hosts' midfield, with the prolific pairing of Cristiano Ronaldo and Gonzalo Higuain up top. Barcelona's line-up is maverick to say the least - Gabby Milito or Carles Puyol will play at right-back, with Dani Alves in an advanced right-wing position. It might be so they can double up on Ronaldo, but talk about leftfield. Real Madrid: Casillas, Ramos, Arbeloa, Albiol, Garay, Gago, Xabi Alonso, Marcelo, Van der Vaart, Higuain, Ronaldo. Barcelona: Valdes, Milito, Maxwell, Puyol, Pique, Busquets, Keita, Xavi, Alves, Pedro, Messi. 2035: Strange team news, coming straight up. 2033: It's a truly monumental night for Spanish football. Real Madrid and Barcelona are joint-top of La Liga on an extraordinary 77 points from 30 games played and the winners of tonight's showdown in the Bernabeu will become hot favourites to win the title. On the greatest day of betting in the British sporting calendar, where's your money? 2030: I knew you'd come back. Welcome to El Clasico. 1915: So far today, Burnley have spanked Hull, West Ham have edged nervously past Sunderland and Chelsea have reached the FA Cup final. In 75 minutes, after a cheeky sarnie and a stroll and a quick call to me mam, I'll see you for one of the most eagerly-awaited league matches of all time - Real Madrid versus arch-rivals Barcelona. From redandblackT on 606: "Villa have had two great cup runs but really MON has to start using all of his squad at sometime. You just can't use the same players for every single match throughout a season." 1908: By winning their seventh straight FA Cup match at Wembley in a row, Chelsea have just reached their 10th FA Cup final so congratulations to them for that. They are the first club to reach back-to-back finals since Manchester United in 2004 and 2005. 1905: Before you lot decide to get on with the rest of your lives, don't forget that we're covering Real Madrid v Barcelona from Spain from 2030 BST tonight. Kick-off in the Spanish capital is half an hour later, look forward to you getting involved in El Clasico. From Lee, Bristol, via text to 81111: "Just a discussion point, something that I have been taught playing for my team is that a referee will never lose you a game. Yes decisions don't go your way, but you have to ask have Villa been good enough to beat Chelsea - and the answer is no." Chelsea's Frank Lampard: "At half-time we said to each we hadn't even started yet. The confidence came after the goal and we deserved it in the end. The pitch looked decent, but it was very hard underneath. The double is still on, it'll be very tough but we want to go all the way." 1855: When I said they don't deserve it, I meant Villa, not Chelsea. Over 90 minutes the Blues were probably just the better of the two teams, but it wasn't a 3-0. You can't blame Martin O'Neill and his men for looking so dejected at full-time. Villa will point to the penalty decision that was not given in the first half, but they did tire once again in the second half and Chelsea always looked the more likely to go and win it. The scoreline's horrifically harsh, though. Chelsea goal: They don't deserve it. Chelsea break with pace and after Florent Malouda runs down a blind alley he tees up Nicolas Anelka and he then in turn sets up Frank Lampard, who takes a touch and slots into the far corner. It's brutally ruthless. 1850: Salomon Kalou fires in a left-foot shot from the edge of the box that Brad Friedel does well to parry away with his right hand, before Florent Malouda crashes the rebound wide. 3-0 would be really harsh on Villa. 1849: The ball bobbles up off a divot and Stewart Downing smacks a cross from the left out of play and behind for a goalkick. The Villa players, and their manager, look totally deflated. 1848: Into an utterly pointless period of injury time now and there will be four minutes of it. Chelsea goal: The Villa fans start to flood out of Wembley after Michael Ballack's deep cross from the right finds Florent Malouda at the far post, the impressive Frenchman coolly sweeping home to wrap up this unimpressive FA Cup semi-final. BBC Radio 5 live's Chris Waddle: "When you've got the upper hand for the first 20 minutes or so against a team like Chelsea, you've got to use it. You've got to score and take advantage of it." 1843: Five minutes of normal time left, it remains Aston Villa 0-1 Chelsea. 1841: That's the best of John Terry - magnificent defending as Gabby Agbonlahor threatened to get a shot in inside the Chelsea box. Defensively, Terry has been imperious today. From Renzo_23 on 606: "I'm stunned yet again by the officials. Martin O'Neill is gonna blow his lid. It will be him who gets suspended." 1839: Aston Villa bring Emile Heskey on for John Carew. Alan Green on BBC Radio 5 live bemoans the fact that Villa don't have a Plan B, and it's hard to disagree with him on this evidence. 1837: Nicolas Anelka is on for Didier Drogba. Villa aren't looking much like getting back into this, in all honesty. 1833: Richard Dunne, up from a free-kick, tries to spin Didier Drogba in the Chelsea right-back position, but the Ivorian gets in a good challenge. Nearly looked like Total Football for a minute. Chelsea bring Michael Ballack on for Deco. 1831: John Terry is shown a yellow card for a heavy challenge on James Milner as Villa tried to break after a Chelsea corner. Not a great one for your England team-mate, JT - wonder what Fabio Capello makes of it? West Ham boss Gianfranco Zola: The players put a lot of passion in. We got the three points we needed and deserved. We've improved our position but there is still a long way to go and we need to maintain our focus. The circumstances can change completely, but we made a lot of sacrifices to make things change." From InfostradaLive on Twitter: "Didier Drogba has now scored in each of his 5 competitive matches for Chelsea at Wembley." 1827: The Villa fans have gone very, very quiet. You'd have to fancy it staying at 1-0 to Chelsea now - Martin O'Neill's side will have to come up with something pretty special to get back in to this one. Chelsea goal: It's a goal the game deserves - ie not a very good one. But has it just put Chelsea into the FA Cup final? Didier Drogba wins a corner after cutting into the box and after it is half-cleared by Richard Dunne, John Terry hammers it left-footed to the back post where Drogba diverts it past Brad Friedel and into the corner of the net. 1822: Chelsea make the first change of the match, with Salomon Kalou coming on for Joe Cole. Some Chelsea fans boo Carlo Ancelotti's decision to take Cole off. Fabio Capello watches on, unremarkably. From Dave M, via text to 81111: "Tell me when there was last an exciting match on a terribly awful pitch? Professional footballers need a good pitch to strut their stuff. Simple as." 1819: Ashley Young tricks his way past Jon Mikel Obi, but his well-struck cross to the near post is punched behind by Petr Cech, who comes out well to claim the resulting corner. More than an hour gone, it's Aston Villa 0-0 Chelsea. 1817: Better from Villa now, firstly as James Milner's cross from the left drifts just too high for John Carew and then from Ashley Young down the right, but his cross is blocked. The volume's gone up inside Wembley, too. Hull manager Iain Dowie: "I hope we are the wounded animal next weekend, clearly it's not a result we would like to be associated with. We never pushed. We started to some bizarre things, didn't pass the ball away and gave away poor penalties at poor times. There is a fragility about the place. We've got five games left and I will demand a response." Burnley manager Brian Laws: "It has been a devastating week, the hardest week in the world. But what a fantastic response by the players - this has given everyone a lift. I'm an easy target. I'm in the bottom three, apparently I'm falling out with players. It's an absolute joke. I'm in a fighting mood - I dedicate the win to the players." 1813: Chelsea have more urgency about their game - with the Premier League still to play for, they could well do without extra-time and penalties tiring them out. 1811: Didier Drogba fizzes in a cross from the Chelsea left and Joe Cole is inches away from getting a crucial touch at the near post, with Brad Friedel gratefully collecting the ball a split second later. From ShivMufc on 606: "Imagine if this goes into penalties, with everyone slipping, JT steps up for a penalty..."
1807: Fierce half-volley from Deco as Villa only half-clear a corner, but the Portuguese is a few yards off target with his right-foot effort. 1806: See 1746 - I think someone forgot to tell the corporates. In drips and drabs, they'll toddle back to their seats after smashing down Wembley's hospitality. I hope whatever they gorged themselves on was better than the pitch. Meanwhile, Chelsea have upped the tempo a little. 1804: Close. Stewart Downing swings in a corner from the Villa right and John Carew gets in front of his marker to glance a header just wide of the far post. This game needs a goal. 1802: Back under way at a frankly disappointing Wembley stadium, where the game is poor and the pitch is abysmal. From henrywinter on Twitter: "Groundsmen forking away... pity they can't change pitch at break. Surely with £757m spent on Wembley they could have afforded Alan Titchmarsh." 1757: Thank goodness there's another game to look forward to later. In the capital of Spain at 2100 BST, Real Madrid and Barcelona go head-to-head in El Clasico, a game which is probably going to decide the winners of La Liga. I really hope you'll join me for it - and you know, it's not just about Lionel Messi and Cristiano Ronaldo (though clearly they're both awesome). From Neale, Edinburgh, via text to 81111: "Is Howard Webb considered our best referee because he looks a little bit like Collina? Because he definitely doesn't ref like him." From sambloke on 606: "Chelsea: Terrible. Pitch: One big banana skin. Referee: Didn't show up. Aston Villa: Should be at least 1-0 up." Dunno what else to add to that. Don't forget, we will go to extra-time and penalties if it stays like this. Major talking point of the first half - Howard Webb's refusal to give a penalty to Villa (see 1717). 1746: There will be a minute of stoppage time at the end of the first half. Will someone tell the guys in the corporate seats at Wembley the interval only lasts 15 minutes usually? 1742: The two managers are prowling their technical areas at Wembley and haven't sat down yet this half, I don't think. Neither of them has fallen over yet though, you'll be pleased to hear. BBC Radio 5 live's Chris Waddle: "He looks very, very leggy, James Milner - I just wonder how much training he's done. I wonder if he hasn't done any, but they've just thrown him in anyway." 1738: Yuri Zhirkov, after slipping, sends a cross into the Villa box and Didier Drogba slips too so he cannot get near it. Moments later, Joe Cole spins in a shot from the right-hand corner of the Villa six-yard box, but Brad Friedel gathers safely. 1735: That block from Stephen Warnock is worth a goal. Florent Malouda sends over a cross from the Chelsea left and Didier Drogba hammers it goalwards from 12 yards, only for Warnock to throw his body in the way. Great defending. From chrisbevan_bbc on Twitter: "Villa's James Milner having an excellent game so far. Working hard defensively and a threat going forward too... covering a lot of ground." 1733: Bad moment for Petr Cech as he misjudges a Stewart Downing cross and John Terry does very well to head it behind, with Gabby Agbonlahor waiting behind the Chelsea captain. 1731: You don't want to keep talking about it, but the players are clearly finding it difficult with this surface. I mean clearly they should get on with it and try to get to an FA Cup final, but it's still rubbish. 1728: Chelsea have been short of their usual fluency so far, save for Frank Lampard, who's always top-class to be fair to him. Florent Malouda trips on the ball and Alan Green on BBC Radio 5 live calls the pitch "a joke." From Anon, via text to 81111: "Webb is having an awful season. If refs were picked on form like players, he'd get nowhere near the World Cup." 1723: Villa's work-rate is something to behold - they aren't giving Chelsea any space whatsoever, and the lack of room prompts Florent Malouda to hammer a pass hopelessly out of play. 1721: Villa are doing most of the attacking now - it's a very lively start for Martin O'Neill's team, who, let's not forget, suffered an appalling 7-1 reverse at Chelsea in the league only 14 days ago. From hi on 606: "Howard Webb is an embarrassment." 1717: Massive call for referee Howard Webb already. Gabby Agbonlahor collects the ball inside the Chelsea box and superbly rolls Jon Mikel Obi, the Chelsea man sticking out his right foot and bringing Agbonlahor down. It should be a penalty, but Webb waves play on. 1715: First half-chance for Aston Villa now too. Stiliyan Petrov shifts the ball inside to James Milner and he takes a touch before fizzing in a low drive from 25 yards that finishes a couple of inches wide of Petr Cech's right-hand post. Good sighter, maybe. 1714: Fabio Capello looks on from high up in one of the stands at Wembley, presumably as perplexed as the rest of us as to why they are playing two FA Cup semis in two days on this frankly terrible football pitch. 1713: First opening for Chelsea as Frank Lampard tees up Joe Cole down the Blues left and after cutting inside Carlos Cuellar, his right-foot shot flies a yard or two wide of Brad Friedel's right-hand post. From InfostradaLive on Twitter: "Alexander is 38 years and 182 days old today. He is now the 4th oldest ever goal scorer in PL history, after Sheringham, Windass and Pearce." 1708: Now he can relax - Football League Danny: "League One - Millwall wallop Gillingham 4-0 and go into second place with five games to go. Leeds beat Southend 2-0 and remain right in the promotion mixer. Swindon walloped 3-0 at Colchester and Charlton beaten 1-0 at Saints - bad days for them. Inconceivable result in League Two - Torquay (21st) destroy Rochdale (top) 5-0. Notts County, 1-0 winners at Northampton, now title favourites, I reckon. Darlington retain mathematical possibility of survival after 0-0 draw - but they're doomed, frankly." 1707: So far at Wembley, the main event has been most of the players falling over. Hmm. 1706: The man needs a break. It's a Champo wrap from Football League Danny: "Phew. Some kind of busy day. Key points, beyond West Brom's promotion and Stockport's relegation. Newcastle 4-1 Blackpool - title beckons for Magpies, Blackpool play-off hopes hit. Forest 3-0 Ipswich. Forest definitely in the play-offs. Palace 0-2 QPR - great win for Rangers, piles pressure on Palace. Watford 1-0 Plymouth - Hornets triumph in relegation 12-pointer... Stay tuned for more." BBC Radio 5 live's Chris Waddle: "They might as well just put ice down because whatever they do with the pitch at Wembley doesn't work, it's ridiculous." From LivingForFootball on 606: "Just wanted to pass good wishes to the Pompey team and fans. You kept plugging away in a very bad situation caused by a series of irresponsible owners. Especially want to spread some praise to the manager for staying professional throughout these hard times. Hope you can make it back when the money situation is resolved." 1701: Football League Danny: "Final score - Stockport 1-3 Yeovil. Stockport down." 1700: Football League Danny: "Doncaster 2-3 West Brom - Baggies promoted. Champagne. Open. Now." 1700: Chelsea get us under way at Wembley as their FA Cup semi-final with Aston Villa kicks off. Aston Villa: Friedel, Cuellar, Dunne, Collins, Warnock, Ashley Young, Milner, Petrov, Downing, Agbonlahor, Carew. Subs: Guzan, Luke Young, Sidwell, Delfouneso, Delph, Heskey, Beye. Chelsea: Cech, Paulo Ferreira, Terry, Alex, Zhirkov, Deco, Mikel, Lampard, Joe Cole, Drogba, Malouda. Subs: Hilario, Ivanovic, Ballack, Kalou, Sturridge, Belletti, Anelka. 1656: Full-time Hull City 1-4 Burnley Doesn't look like Brian Laws has lost the dressing room does it, Joey Gudjonsson? An incredible turnaround having conceded a goal so, so early on - Burnley are still four points from safety, but they now have hope where before there was none. Burnley goal: That's a stunning way to finish it and Iain Dowie looks like he's about to try and swallow his own face. Wade Elliott curls a fabulous free-kick from the left-hand side of the area over Boaz Myhill and into the top corner. Brian Laws cannot stop smiling, and why the heck should he? What an enormous win for West Ham and for Gianfranco Zola - will these three points keep them up? It also relegates Portsmouth, though you probably knew that from the caps and bold below. 1652: Heart in mouth time as Bolo Zenden shoots at West Ham, but Radoslav Kovac makes a brilliant block. 1651: Guillermo Franco has the ball in the Sunderland net but it's disallowed for handball. It takes the West Ham players at least one minute to realise it doesn't count. Remarkable scenes. From Oli in London, via text to 81111: "If Burnley win this game, their points taken from away games will have increased by 300% - what a cracker! Just shows how important this game is." 1647: Carlton Cole has a half-chance to wrap up the points as Anton Ferdinand allows him to get in behind, but the striker's left-foot snap-shot from the left-hand side of the area flies just too high. Into injury time. 1646: It's all going off. Football League Danny: "Leeds are 2-0 up on Southend. Newcastle now lead Blackpool 4-1. And Doncaster are now just 3-2 down on West Brom - Baggies fans might want to have one hand on the champagne but the other hand ready to close the fridge door. It's difficult to know what to do, to be fair." 1644: Have Sunderland got a dramatic equaliser in them? Can Hull score twice in a couple of minutes? We're about to find out. From chrisbevan_bbc on Twitter: "A change of boots for Villa striker John Carew near the end of the warm-up. Unfortunately the Wembley pitch is already cutting up a bit." 1641: Jan Venegoor of Hesselink fashions some space inside the Burnley area and his cross-shot to the far post is just too far ahead of a stretching Jozy Altidore. Iain Dowie, the famed rocket scientist, looks thoroughly perplexed. 1638: Nice work, Football League Danny: "Stockport 0-3 Yeovil - looks like it's curtains for the Hatters. Lose today and they're down. Meanwhile Forest are 3-0 up on Ipswich and are on course to seal a play-off place today. It'll be 13 home wins in 14 games for Forest. Impressive." 1637: Hull are pumping balls into the Burnley box, but they don't look like getting back into this. Brian Laws prowls the touchline, hoping to shortly celebrate the most important win of his managerial career. 1635: Very tense at West Ham and ragged too, with perhaps the visitors Sunderland slightly the better of the two teams at the minute. 1633: Football League Danny: "West Brom now 3-1 up on Doncaster. Slight wobble appears to be over. Don't open the champagne yet, but you can start practising your uncorking technique and sorting out where you want to aim the cork." From manfrombelmonty on 606: "Double toe-poke penalty delight from Alexander! Nerves of steel that boy." Burnley goal: Football - you couldn't make it up. David Nugent goes on a Lionel Messi-esque dribble on the left-hand side and after getting past two defenders surges into the area, eventually brought down by Steven Mouyokolo. It's a penalty, and Graham Alexander smacks it into the top corner. What a scoreline. 1626: Even more Football League Danny: "Goals. Palace 0-2 QPR - huge win looms for Rangers. League One - Millwall 3-0 Gillingham. Great day for the Lions. Torquay 4-0 Rochdale - definitely a wheels falling off situation for the League Two leaders." 1625: Aston Villa manager Martin O'Neill makes one change from the side that beat Bolton 1-0 last weekend, with James Milner returning from an Achilles problem and replacing Fabien Delph in midfield. Defender Richard Dunne has also recovered from an Achilles injury and starts. Chelsea recall Didier Drogba in place of Nicolas Anelka and, with Petr Cech preferred to Blues' usual FA Cup goalkeeper Hilario, that switch of strikers is boss Carlo Ancelotti's only change from the team that, in the last fortnight, has thumped Villa 7-1 in the league and beaten Manchester United at Old Trafford. 1624: Football League Danny: "Newcastle 3-0 Blackpool - Kevin Nolan with the goal. The promoted Magpies showing no signs of taking their foot off the pedal, and it looks like they've got the title in their sights. Elsewhere, Leeds are 1-0 up on Southend thanks to Max Gradel. Automatic promotion hopes still alive for the faltering home side." 1623: More drama at Upton Park - within seconds of coming on for David Meyler, Kenwyne Jones's run sets up Sunderland striker Darren Bent in a superb position on the edge of the box but under no pressure, the England player completely loses his footing and the attack comes to nothing. A lucky escape for the home side there. Burnley goal: Debatable. A Burnley free-kick finds Michael Duff inside the Hull box and just as the defender is about to shoot, there's a challenge from George Boateng. The ref decides it's a penalty and Graham Alexander steps up to coolly stroke it into the corner. What a comeback. 1618: Football League Danny: "I labelled it a a super-tense rip-roaring relegation ding-dong terror-inducing tear up at 1434, and Watford v Plymouth is proving to be exactly that. And the deadlock is broken - Heidar Helguson puts the Hornets 1-0 up with a potentially vital strike. Elsewhere, Forest lead Ipswich 2-0 - Guy Moussi with the goal." 1617: So close for Sunderland - Steed Malbranque and Darren Bent unpick the West Ham defence and Lee Cattermole's low shot creeps inches wide of Robert Green's right-hand post. Their best effort so far. 1616: Got to score. Martin Paterson fizzes over a cross from the Burnley right and it bounces all the way through to Michael Duff at the far post. He's six yards out, has enough time to take a touch and then slaps his right-foot effort over the bar. Brian Laws is heartbroken. From Daniel Craig David James on 606: "First two minutes of the second half have were fantastic catching and hoofing practice for Brian Jensen and Boaz Myhill." 1611: Best wishes go to Andy Dawson, who is stretchered off at Hull and replaced by Nicky Barmby. Dawson did try to get up and though he couldn't was smiling ruefully, so hopefully it's not too serious. 1609: Football League Danny: "Jay Emmanuel-Thomas is doing his bit for the cause of party pooping - he's notched for Doncaster who now trail West Brom 2-1. Nottingham Forest, meanwhile have just taken the lead at home against Ipswich. Baggies still getting promoted today as it stands." Hammers goal: Route one - and West Ham are back out of the relegation zone. Manuel da Costa launches a free-kick into the Sunderland box, Carlton Cole is strong enough to get the flick-on and from 10 yards, Ilan guides the ball into the bottom corner. Huge goal for the hosts. 1606: Hull's Andy Dawson has gone down clutching his ankle after a heavy 0 but fair - challenge with Tyrone Mears. Looks painful. 1604: And they're off... again at Hull 1-1 Burnley. 1602: Started again at West Ham 0-0 Sunderland. 1600: Early FA Cup semi team news: Chelsea bring Didier Drogba back in for Nicolas Anelka, while Villa recall James Milner in place of Fabien Delph. From Graeme Stamper, Richmond, via text to 81111: "Another lifeline for Pompey. The team refuse to be relegated!" 1555: It's a brilliant day of sport, isn't it? The Grand National takes place at about 1615 BST and Ollie Brett is following events from Aintree in his own inimitable style. If golf's your thing, you will certainly want to know that Paul Fletcher is casting his eye over events at The Masters, with a brace of Englishmen sat atop the leaderboard in the US. I have only one thing to add: come on Forest fan Lee Westwood. 1552: Football League Danny: "West Brom scored again on the stroke of half-time, with Chris Brunt putting them 2-0 up at Doncaster. Not quite time to crack open the champagne yet, Baggies fans, but you might want to stick it in the fridge... Premier League promotion could be 45 minutes away." 1550: Line-ups and team news on the way from Wembley, with Aston Villa v Chelsea in the first FA Cup semi-final due to kick off at 1700 BST. Our man Chris Bevan will be getting involved from the English home of football. Similarly shaky scenes at the KC Stadium. Hull got off to a dream start, but Burnley improved once they'd scored and this one is big time in the melting pot too. What a second 45 minutes awaits. It's tense, it's nervy, it's edgy - and it's still massively up for grabs. One thing is for sure - if West Ham are going to win, they won't be handed the three points, they'll have to be brave. 1546: I thought it was 1546 BST, but no - Football League Danny: "Championship o'clock. Boro 1-0 Sheff Weds - the Owls are really flapping at the foot of the table. Bristol City 1-0 Swansea - resurgent Robins stalling Swans promotion push. Peterborough 0-1 Leicester - Foxes making hay at already-relegated Posh." 1544: Football League Danny: "Southampton 1-0 Charlton - Michail Antonio with the Saints goal. The home team are just a bit too far off for a play-off push - aren't they? And it's a potential hammer blow for the Addicks' automatic promotion hopes." 1542: Jozy Altidore is booked at Hull for kicking the ball in the direction of the assistant referee, who gave a decision against him seconds earlier. He missed by a few yards, incidentally. 1540: Drama at West Ham. A high ball into the area sees Carlton Cole go up with Craig Gordon and the keeper loses the ball. Cole's suddenly in front of goal 12 yards out and Gordon rugby-tackles him to the floor - but the whistle had already gone for Cole's apparent foul on Gordon. Nonsense - and if the keeper hadn't heard the whistle, he's a lucky boy. 1539: Football League Danny: "Snapshot. Newcastle 2-0 Blackpool - Magpies edging towards title, and guaranteeing Nottingham Forest a play-off place in the process. Stockport 0-2 Yeovil - Stockport going down. Millwall 2-0 Gillingham - Lions going second. Torquay 3-0 Rochdale - er, blimey. Really?" 1537: Chance for West Ham as Kieran Richardson gives the ball away in the left-back position and Carlton Cole gets into the area and squares to Ilan, but the Brazilian slips as he receives the pass and the opportunity goes begging. Burnley goal: Not so hapless now. Brian Laws sticks two fingers up to the critics as Tyrone Mears cuts inside his defender down the right and crosses to the near post, where Martin Paterson expertly controls the ball and shoots low, first-time into the far corner. Brilliant finish. 1534: Sunderland goalkeeper Craig Gordon misdjudges and handles about half a yard outside his area. He's booked by referee Michael Jones. 1534: More prolific than Lionel Messi in his back garden, that's Football League Danny: "Interest. Shaun Batt puts Millwall 1-0 on Gillingham and as it stands, the Lions are going second in League One. And in League Two, Torquay have gone 2-0 up on leaders Rochdale." 1532: Boo, Football League Danny, boo: "Big news coming in. A beautiful free-kick from Graham Dorrans puts West Brom 1-0 up at Doncaster. If the Baggies win, they're up." 1530: Super save from Burnley keeper Brian Jensen, denying Jozy Altidore with his face having raced from goal after the USA striker had twisted inside his defender - and from the rebound 18 yards out, Jimmy Bullard shoots narrowly over. From WiganGman on Twitter: "Burnley really don't deserve to be in the Prem anymore - they're not even trying!" 1528: Sunderland are enjoying the better of it at West Ham and Steed Malbranque is the liveliest player on the pitch. Darren Bent has another shot saved by Rob Green - remember with Hull winning, West Ham are in the bottom three as it stands. 1527: And yet more Football League Danny: "In League One, Yeovil have taken the lead at Stockport thanks to Dean Bowditch. The Hatters go down today as it stands. At the top, Colchester lead second-place hopefuls Swindon 1-0, while leaders Norwich trail MK Dons 1-0. At home. Crikey." 1526: Jimmy Bullard collects a pass, chips the ball up and slaps it over Brian Jensen's crossbar. Cheeky, but a tad too ambitious. From Gary, via text to 81111: "It looks like the Burnley goal, like Brian Laws, is an easy target." 1522: More excitement for the Hammers. Craig Gordon's attempted clearance hits the back of Carlton Cole and rebounds towards the goal, but there is no-one following it up. Cole then causes more trouble for Sunderland and panics defender Michael Turner into clearing the ball as far as Radoslav Kovac, whose shot from outside the box goes over the bar. 1520: West Ham have come into it a little more in recent minutes and the ball falls nicely for Valon Behrami 25 yards out, only for the Swiss to hammer hopelessly over. 1519: Football League Danny: "Big goal. Akos Buzsaky puts QPR 1-0 up at Crystal Palace. A Rangers win leaves them all-but safe and leaves Palace in huge bother." 1517: Clarets all over the place at Hull and now there's claret all over the place too. Burnley pair Michael Duff and Leon Cort try and clear the ball and Duff has blood pouring from a gash on his head. He wants to continue. 1516: Nervy times for the Hammers as Darren Bent chases on to a ball on the left-hand side of the West Ham box and lifts it just over Rob Green's goal. At the other end, Valon Behrami fires in right-footed and forces a decent save from Sunderland keeper Craig Gordon. 1515: Football League Danny: "A relatively quiet start in the Football League with no goals anywhere for the first 10 minutes in 35 matches. The silence is shattered at St James' Park, however, as Jonas Gutierrez puts Newcastle 1-0 up on Blackpool. The Magpies are already up, of course, but a win for them today would have the knock-on effect of guaranteeing Nottingham Forest a play-off berth." 1512: Tame start at West Ham so far, surprisingly. A Sunderland corner from the left is whipped across the six-yard box and it evades everyone, with Michael Turner unable to turn home in front of goal. 1510: My colleague Danny raises a fair point - as things stand, Portsmouth will be relegated from the Premier League. From MUFC_4_E3VER on 606: "Brian Laws's game plan has just disappeared into thin air." I'm surprised you think he had one. 1507: If football was all about conceding quickly, Burnley would be unstoppable champions. It took them 181 seconds to concede against Man City last week. Today they enjoyed parity for 129 seconds. 1505: You can blame the manager all you like, and Brian Laws does look utterly hapless already, but he's not playing - and that was pathetic defending in a game Burnley have to win. Makes you wonder. Hull goal: Burnley make a similar start to last week, in the worst possible fashion. They are opened up down their left, as Jozy Altidore latches on to a simple pass and lofts a pass to the far post, where a glaringly unmarked Kevin Kilbane nods simply into the net. It's so embarrassing I feel I should stop there. 1502: Mido misses out today for West Ham because he has a virus, in case you were wondering about the absent Egyptian. 1501: And we're under way at Hull, too. 1500: Under way at West Ham. 1459: So, to clarify, we're about to get under way in the Premier League matches between Hull and Burnley and West Ham and Sunderland. The FA Cup semi-final between Aston Villa and Chelsea kicks off at 1700 BST, with Real Madrid v Barcelona starting at 2100 BST. From Jack, Northampton, via text to 81111: "Very honest & scathing words from Laws there, good to see a manager talk about problems head on." 1455: BBC Sport legend Chris Charles has had an astonishingly successful day already. Along with with some chums, Chrissy has walked from Loftus Road to Selhurst Park to raise money for the QPR Tiger Cubs - a team made up entirely of children born with Down's syndrome. The legends have raised over £3000 already, a phenomenal achievement. Massive, massive congratulations. 1451: West Ham v Sunderland: Fresh from nicking a point at Everton last week, courtesy of the best cross-diving header combo of the season so far, the Hammers should be bang up for this one. After all, they could be four points clear of the drop tonight - or at worst, they might have dragged Wigan back into the mixer. Burnley manager Brian Laws on BBC Radio 5 live: "At the moment, I'm a very easy target. Kevin McDonald has made a stupid decision. He's not the brightest lad in the world and he didn't mean to harm anybody but he's apologised, which is great. Joey Gudjonsson has made some remarks. It doesn't surprise me. He's not even figured in the team, or the squad, since I got here and he's not getting a contract, so it's a parting shot at the manager. All I can say is there are no such problems. We have unhappy players, everybody has, but we don't dwell on it. It's just a cheap shot, and a disappointing one, but we'll deal with him in a professional manner - unlike him, who has been very unprofessional." 1445: Brian Laws has faced his toughest week in management, no question about that. Smashed 6-1 at home by Man City last weekend, having to deal with one of his players walking out at half-time and being slaughtered in the press by another one of them. Lose today, and Laws' week might end with the sack. 1443: Hull v Burnley: With the runs these two teams are in, they'd almost certainly choose to be playing each other today. Stuck in the Premier League's drop zone, it's must-win o'clock for both - though as Hull are three points better off than Burnley, they could just about relegate the Clarets today. Hull have lost six of seven; Burnley eight of nine - it's going to be brutally tense, so don't expect much quality. From chrisbevan_bbc on Twitter: "Two hours to kick-off & Wembley Way filling up, most fans either 'refuelling' or basking in the spring sunshine." 1438: He's gone one better than that Lionel Messi - Football League Danny completes a stunning pre-kick-off hat-trick: "In League Two, Darlington will be relegated if they lose at home to Accrington and Cheltenham and Torquay both win while Lincoln avoid defeat. At the top, unstoppable football machine Rochdale could be promoted - but they need to win and hope a whole bunch of results go their way. Even if it doesn't happen today, Football League Danny says Dale are up and Darlo are doomed." 1436: What? You want more Football League Danny? Oh, OK: "League One basement dwellers Stockport are down if they lose at home to Yeovil. Even a win or draw may not be enough if other scorelines go against them. At the top, rampant leaders Norwich host MK Dons. Behind them, it's super tight as Swindon, Millwall Leeds and Charlton are separated by just two points. Eye-catcher of the day? Southampton host Charlton - ooh, it's like Premier League 04-05 all over again." From Simon, via text to 81111: "Burnley fan stuck in Hull end. Just refused to shake hands with Roary the Tiger. He cried." 1434: Let's ramp today up a notch, with Football League Danny: "With Newcastle already promoted from the Championship, attention turns to West Brom who could boing back into the Premier League today. If the Baggies win at Doncaster, they're up. Even if they draw or lose, events down the M1 could promote them. Nottingham Forest host Ipswich and if Forest don't win, the Baggies are up regardless. At the other end, Watford (21st) host Plymouth (23rd) in a super-tense rip-roaring relegation ding-dong terror-inducing tear up. And things will scarcely be less tense as Crystal Palace (20th) host QPR (18th) in a London derby." 1432: Hey, anyone fancy a Stevo's Grand National Predo to boot? Come on, can't be any worse than the footy ones, can it? 1428: Hull midfielder George Boateng has overcome concussion while Ibrahima Sonko returns to the side. Midfielder Stephen Hunt has failed to overcome a foot problem and misses out. Burnley club captain Steven Caldwell has recovered from his groin injury and returns to the bench having not played since December, but midfielder Stephen Jordan missed out with a knee problem. Wade Elliott makes his 200th appearance, but there is no place for Kevin McDonald in the squad after he controversially watched the second half of his side's 6-1 defeat to Man City in the pub, following his substitution. 1425: West Ham have Valon Behrami in for the suspended Scott Parker, and strikers Guillermo Franco and Alessandro Diamanti are both fit to start on the bench after injury scares. Ilan, who came on to score the late equaliser at Everton last time out, starts in place of Mido, who is not even on the bench. Sunderland stick with the same starting XI that beat Spurs 3-1 last time out. Anton Ferdinand faces his old team, but another ex-Hammer George McCartney misses out. Hull: Myhill, McShane, Sonko, Mouyokolo, Dawson, Mendy, Boateng, Bullard, Kilbane, Fagan, Altidore. Subs: Duke, Barmby, Geovanni, Folan, Marney, Vennegoor of Hesselink, Cairney. Burnley: Jensen, Mears, Duff, Cort, Fox, Alexander, Paterson, Cork, Elliott, Nugent, Steven Fletcher. Subs: Weaver, Carlisle, Caldwell, Blake, Bikey, Thompson, Eagles. 1420: You know, it might just be a day of shocks in the world of sport. Already on this magnificent Saturday, Scottish Division One side Ross County have dumped Celtic out of the Scottish Cup. Fancy another 100-1 punt for the National? Oliver Brett's all over events at Aintree already. West Ham: Green, Faubert, da Costa, Upson, Spector, Stanislas, Kovac, Behrami, Noble, Cole, Ilan. Subs: Kurucz, Gabbidon, Franco, McCarthy, Diamanti, Daprela, Spence. Sunderland: Gordon, Ferdinand, Da Silva, Turner, Richardson, Henderson, Meyler, Cattermole, Malbranque, Bent, Campbell. Subs: Carson, Bardsley, Hutton, Zenden, Jones, Kilgallon, Mwaruwari. 1415: Hey punters, you ever been snapped with one of the world's top footballers? Are they all set to play at the 2010 World Cup in South Africa this summer? Well then, why not get involved in BBC Sport's World Cup Photo Album? Email us that pic at worldcupphotoalbum@bbc.co.uk, but please check the BBC terms and conditions first. 1411: If you've got chat, we want it. Anything'll do, but footy-related stuff's always a bit more useful: text us to 81111 (UK) and +44 7786200666 (worldwide); smash me a tweet @Stevo_football; and mix it up with the 606 regulars. 1407: Line-ups and team news on the way from the KC Stadium and Upton Park, where three teams at least are going to be fighting for their Premier League lives. Sunderland haven't hit the 40-point mark yet, but their 3-1 thumping of Spurs last week has all-but made them safe. Care to predict who might go down using BBC Sport's Predictor tool? I couldn't possibly (Hull and Burnley). 1400: It's the most spectacularly gorgeous day of the year so far. The sun's shining and the whole world seems to be revelling in our little April heatwave. Yet for some reason, I'm thrilled to be in the office today. Can you guess why?